Caspase 8 (active) FITC Staining Kit (ab65614) provides a convenient means for sensitive detection of activated caspase 8 in living cells. The assay utilizes the caspase 8 inhibitor, IETD-FMK, conjugated to FITC (FITC-IETD-FMK) as a marker. FITC-IETD-FMK is cell permeable, non-toxic, and irreversibly binds to activated caspase 8 in apoptotic cells. The FITC label allows detection of activated caspase-8 in apoptotic cells directly by fluorescence microscopy, flow cytometry, or fluorescence plate reader. Activation of caspases plays a central role in apoptosis. Review the full set of caspase assays, or the apoptosis assay and apoptosis marker guide. Active caspase 8 in Jurkat cells following four hours exposure to 50 ng/mL anti-Fas Ab (αFas) (MBL), five hours with 10 μg/mL cyclohexamide (CHX) (ab120093), or one hour pretreatment with CHX followed by four hours with αFas. Background signal subtracted, duplicates; +/- SD. 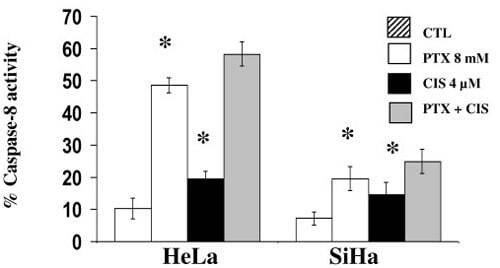 Caspase 8 activation of Hela (left) and SiHa (right) cells after in vitro treatment with pentoxylline (PTX) or cisplatin (CIS) either alone or in combination. Results represent the mean ± SD of three independent experiments carried out in triplicate. (*) p<0.001 vs CTL. Publishing research using ab65614? Please let us know so that we can cite the reference in this datasheet. 1.) For quantification of staining by Flow Cytometry, what should I use as an isotype control? 2.) I would like to analyze live cells that are undergoing apoptosis, can you please suggest a viability dye that can be used with this kit? 3.) In step 1 of the staining procedure, you recommend preparing a negative control using Z-VAD-FMK to inhibit caspase activation. How long should I incubate my cells with this inhibitor? Thank you for contacting us. 1.) You may use Caspase-8 negative cells (cells that were not stimulated to induce Caspase-8) for your negative control in Flow Cytometry. 2.) For a viability dye, you may try using PI but this will need to be optimized for your applications. 3.) The Z-VAD-FMK inhibitor may be incubated for 30-60 minutes or for the same amount of time that your test inhibitor is incubated with the cells. I hope this information is helpful to you. Please do not hesitate to contact us if you need any more advice or information.